The task of the salesperson in the 21st century has become quite complex. To achieve and maintain competitive advantage, sales professionals need to continually update and improve their skills.This article is a continuation of the series 'Persuasive Sales Negotiation. The task of the salesperson in the 21st century has become quite complex. As a consequence of the information age, consumers are better educated than ever, best practices in purchasing have matured, and in some industries the number of competitive offerings is quite staggering, and client organisations have grown larger, more international and complex. Product knowledge, prospecting, cold calling, account plans, opportunity plans, tender responses, presentations, proposal writing, exhibition hosting - these are just some of the activities that sales professionals typically perform in the execution of their duties today. To achieve and maintain competitive advantage, sales professionals need to continually update and improve their skills. It has been said that negotiation is a highly specialised form of communication. Most of us have also heard that a substantial part of our communication comes from our body language, facial expressions, and the quality of our voice - so not just the words we utter (no matter how carefully chosen these words may be). How then as sales professionals, can we ensure that we communicate optimally? How can we ensure that our sales message is compelling, persuasive and will translate into a profitable sale if we close the deal? This article looks at the first two principles. The rule of reciprocation states that we should try to repay, in kind, what another person has provided us with. If somebody has done us a favour, we feel at least slightly obligated to return their favour. Dr Cialdini, regarded in many circles as a leading authority in the science of persuasion, notes an interesting point about reciprocation. There exists a sense of obligation accompanying reciprocation that is so widespread that Alvin Gouldner (1960) along with other sociologists reported that all human societies subscribe to the rule. How then can we use the rule of reciprocation to our advantage? Like most things in life, reciprocation will only work if it is sincerely meant. Dr Cialdini's research has proven that if we want to gain benefit from this rule, we should be the first to give. What we give should be of genuine value to the recipient. If we can genuinely advantage them by our actions, then the rule is invoked by having them feel obligated to respond in kind. Thus if we are truly able to provide our prospective client with something of value to their personal career or circumstances, then they will feel an obligation to assist us in the furtherance of our career prospects and / or personal circumstances too. This should make them more likely to want to do business with us than our competitors. The second principle of persuasion is commitment and consistency. Dr Cialdini describes commitment and consistency as our desire to be (and to appear) consistent with what we have already done. Once we make a choice or take a stand, we will encounter personal and interpersonal pressures to behave consistently with that commitment. In his book, "Influence - Science and Practice", Dr Cialdini contends that to understand why consistency is so powerful a motive, we should recognise that, in most circumstances, consistency is valued and adaptive. Inconsistency is commonly thought to be an undesirable personality trait (Allgeier, Byrne, Brooks & Revnes, 1979; Asch, 1946).The person whose beliefs, words, and deeds don't match is seen as confused, two-faced and even mentally ill. On the other side, a high degree of consistency is normally associated with personal and intellectual strength. It is the heart of logic, rationality, stability and honesty. The way we can use this principle in our sales efforts is to start getting agreements early on in the sales process. We can get our prospective client to agree on the way that they would like you to conduct the sales process, we can get them to agree on the benefits that would be offered by your product, service or solution or we can simply start by getting agreement with our clients with regards the needs that they have. We should get their agreement that if we are able to offer them a solution to their needs that they will take the kind of action that we desire. Once individuals start committing themselves to a particular process or way of doing things, they will find it difficult to not act consistently with their commitments. Sales managers are increasingly realising that managing the sales process is only a small component of driving opportunities to closure. It is equally important to focus on how the company's value proposition is communicated at both an interpersonal and organisational level. It is only through understanding the feedback from the prospective client that we are able to reach decisions around the effectiveness of our sales strategy and processes. After all, judgement of our success at communicating is the privilege of our clients, not ours. Whilst this sounds very obvious, it is often not the case within organisations where the sales process would be measured by events such as the submission of a proposal. Who is to say that the submission of a proposal has any value whatsoever? A proposal could have been submitted to the wrong person or department, it could have been an irrelevant proposal, or it could even have been an offensive proposal. Far better to judge where we are in the sales process by gauging the prospective client's responses to our actions. Below, represented in Figure 1, is a view of the generic sales process found in scores of organisations. This view is typically one dimensional and sees negotiation as an event close to the end of the sales cycle. 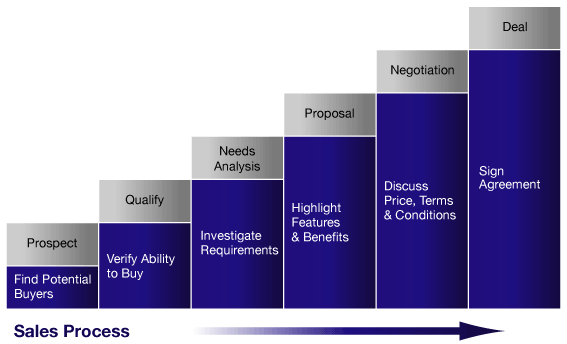 Figure 2 represents The Negotiation Academy - Europe's holistic approach to deal making, blending best practice in negotiation with best practice in the sales process resulting in profitable deals that hold. 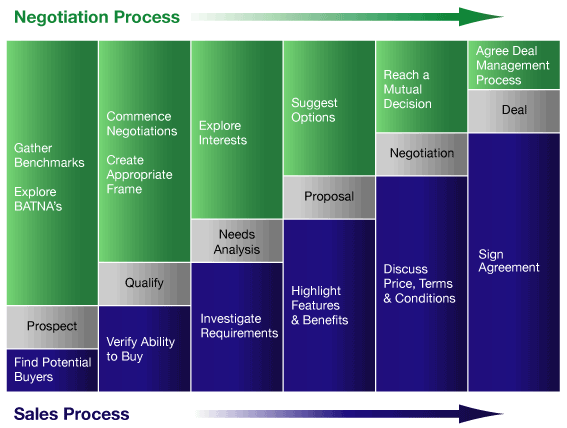 In this model, qualitative assessment is based upon a thorough understanding of the negotiation environment and is built upon the recognition that negotiation is not a once off event during the sales process, but a process itself augmenting the sales process in every phase. In the next edition of The Winner's Circle we will further discuss the principles of persuasion and the steps we can take to deploy these in our sales environments.